Business infused with Life. Life infused with Business. Each building offers a unique perspective of Denver and tenants experience unparalleled views of the Rocky Mountains in the most central location for Denver business. Explore future and existing leasing opportunities for Tower I, Tower II, Annex, the future Tower III as well as future residential and retail. 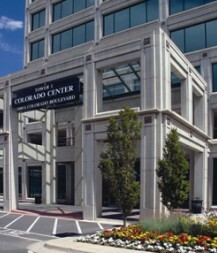 All three buildings offer showers for the use of Colorado Center Tenants. Tower I’s showers are located on the 4th floor in both men’s and woman’s restrooms. The Annex’s showers are located on the 2nd floor in both men’s and woman’s restrooms, and Tower II’s showers are located on the first floor in both the men’s and woman’s restrooms. We have placed cipher locks on the restroom handles of Tower I and Tower II that house a shower. Please ask the Management Office or a security guard for the code if needed. In the Tower I 4th floor restrooms and Tower II 1st floor restrooms there are lockers for your use. These lockers are first come first serve. We ask that you please remove your locks and items nightly. Please see posted signs within the restrooms for additional information. Currently, the designated smoking area for Tower I and the Annex is located by the grassy area across the round-about by the designated covered shelter. 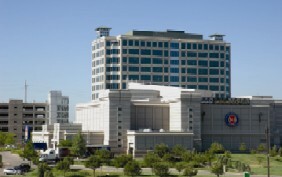 The designated smoking area for Tower II is located on the south west corner of the parking garage adjacent to Tower II. *Please use the designated smoking areas listed above. *Smoking inside the building, outside any of the doors to the building or in the garage is strictly prohibited. *Smoking is never allowed in the loading docks of the buildings due to the fact that the HVAC intake valve is located close to the loading docks. *It is prohibited to smoke electronic cigarettes within the building. In the Annex, the mail is delivered to each suite. The postal carrier will also collect outgoing mail during the time of delivery. For any additional outdoing mail, the most convenient mailbox for Annex Tenants is in the mailroom of Tower I. Drop boxes are located near the elevators in each parking structure of Tower I and Tower II. If there are any changes to the building closures listed above, the Management Office will notify your tenant contact. Obtaining access to a locked suite is not deemed an emergency and requests for this service after-hours will be charge $125.00 per call out. For fire evacuation procedures, please contact the Warden within your company/suite. If you do not have an assigned Warden, please contact the Management Office immediately for updated information and training schedules. Building Life Safety trainings take place about every 6 months.